The best critical communication education should come straight from a team of experts who can customize their training to meet your needs. On-site disaster management training is available through our Professional Services team and be customized to meet your needs. Courses are taught by Everbridge instructors who are experts in emergency notification system requirements. Training can be scheduled based on your availability, and we can adjust the agenda to meet your emergency management needs. With everything on your plate today, finding the time to fully train your staff can create real challenges – but the cost of not training your staff can be very high. 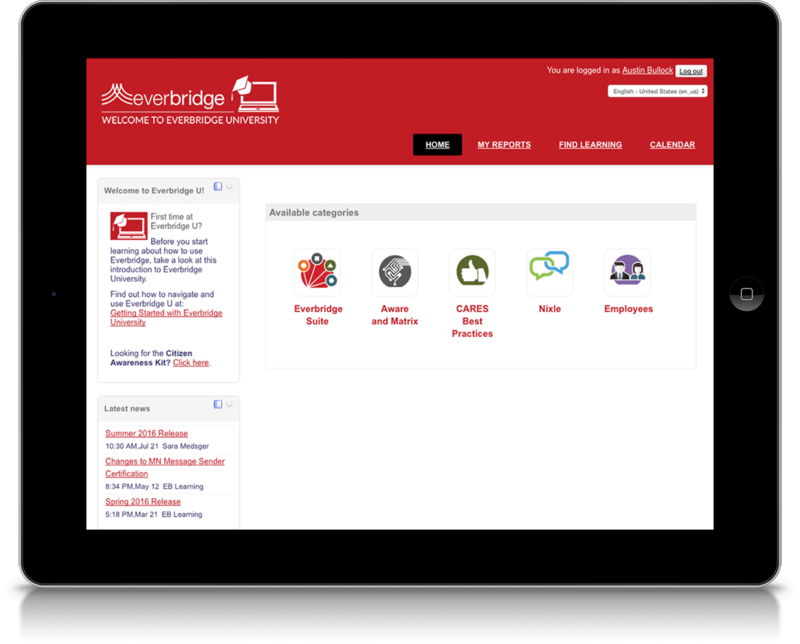 Everbridge University is a self-service, online training resource for the Everbridge Platform for critical communications. Now your team members can train at any time, at their own pace, and from any place that they can access the Internet. Team members don’t have to travel, shuffle and reshuffle their calendars, or require special handling if they miss the training session. Roche Pharmaceuticals uses the Everbridge system for any event that may alter the normal routine of the facility. We have found that one of the most important things in these situations is training and practice. In this way, we ensure that we have put in place the right system and practices to mitigate the risk associated with critical incidents. Everbridge University offers a growing library of product specific, role-based and best practice courses. Watch and listen to animated lessons in order to become an expert on the entire platform, or just get a quick refresher on a key subject. Track the progress of employees as they attend Everbridge University. Demonstrate mastery of a subject by getting certified. Mastering a critical communications system and the associated best practices that will effectively work for your organization requires documentation and certification. MN Message Sender and CARES Certifications are part of Everbridge University and is available at no charge to Everbridge customers and partners. Being able to tailor messages to only identified areas on a map rather than just sending out the message across the entire population, and being able to respond to situations appropriately based on customer communication is so helpful. It allows us a lot of flexibility and saves us a lot of time. 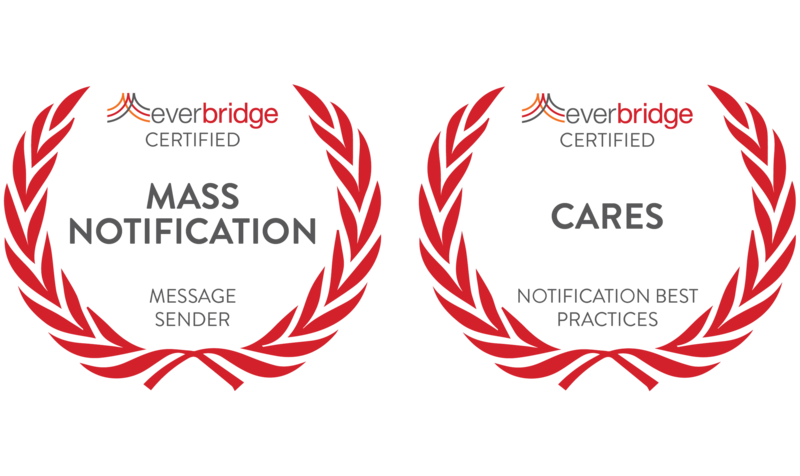 Everbridge CARES: Best Practices for Notifications Certification goes beyond “how to send a notification” in the midst of disaster planning and is focused on creating messages, determining which configuration settings work best for the audience and message, and understanding the common trade-offs that must be considered when messaging to diverse audiences.